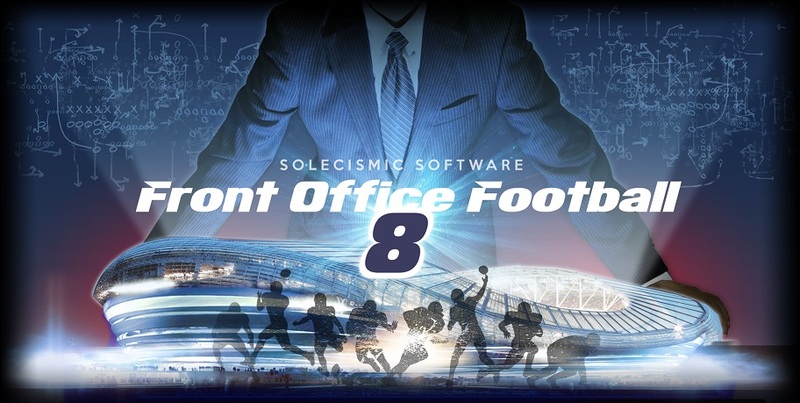 On November 23, 2016, we released Front Office Football Eight, a new version of our flagship product. You can purchase the game exclusively through the Front Office Football Eight Steam Store. The most recent version is 8.2a, released on October 27, 2018. This version contains the 2018 player file and schedule. The game features an innovative new playbook and play-calling design, modeled on how professional coaches prepare for each contest. We made dozens of improvements to the game, including a new interface structure that allows you to move quickly between the nearly 200 screens of information within the game. You can explore your vast Front Office Football universe more thoroughly than ever. Front Office Football Eight includes a multi-player career mode with full ftp support, allowing you to compete in a league with up to 31 other enthusiastic general managers. Solecismic Software is an entertainment software company dedicated to producing cutting-edge career football simulations. We have two primary products available: Front Office Football, our professional football simulation, and The College Years, our college football simulation. A career-play football simulation focuses on elements of the game you won't find in more traditional computer games. You'll still see the action unfold on the field, and in Front Office Football you can even call the plays. But you'll also build rosters, make trades, recruit from thousands of high schools, negotiate contracts and develop your school's academic reputation. The games work together in forming an enjoyable simulated football experience. You can export seniors from The College Years into Front Office Football as draft-eligible rookies. The games work equally well on their own, as you'll find yourself making hundreds of decisions affecting every facet of your teams. "Sports Simulations for the Twenty-First Century"
Solecismic Software was founded in 1998, and soon released Front Office Football, a simulation of professional football in America. The original game won several awards and was nominated for Computer Gaming World's Sports Game of the Year. The sequels, EA Sports Front Office Football and Front Office Football 2001, brought new features and challenges to the series. Like their predecessor, both won an Editors' Choice Award from CGW and a 4 1/2-star review. These games were published by Electronic Arts. Solecismic Software currently self-publishes both Front Office Football and The College Years, and has released ten retail games over the years. Solecismic Software remains committed to career-play football simulation. While we don't have a set release schedule, from time to time we do provide updates on the work in progress. The Football Frontier is mostly analysis of professional and college football. But occasionally, we'll put up an article detailing a piece of development or providing information about future products. We use our Twitter account once in a while. These sites, along with this web site, are the best places for news and information about Solecismic Software. Copyright © Solecismic Software, 1998-2017. All Rights Reserved.